Consumers who had deferred purchases or preferred to stretch their money at discount retailers look all set to splurge again. The latest round of the Nielsen Global Consumer Confidence Survey reveals a sharp increase in confidence levels, Indians being the second most optimistic. 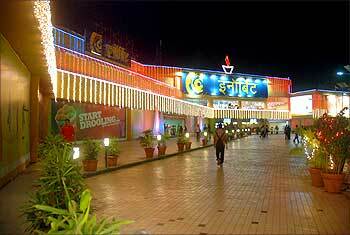 The economic stimulus provided in two tranches by the Centre seems to have done the trick. 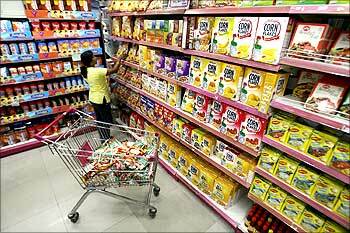 Consumer confidence in the country has bounced back, says the Nielsen Global Consumer Confidence Survey for the second quarter of 2009. Marketers can now breathe a sigh of relief. After slipping from 114 in September 2008 to 99 in March 2009, India's consumer confidence index has risen to 112 in June. (The Nielsen survey is now done every quarter.) This is the highest gain reported by any country. 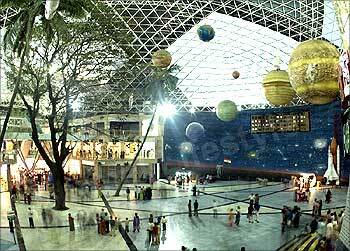 Image: People in a shopping mall in New Delhi. What is more, Indians in June were the second most optimistic people on earth after Indonesians when it came to job prospects over the next one year, most upbeat about the state of their personal finances and third in the ranks of willing shoppers after the British and Australians. This is a marked improvement over March. Though second in job prospects, Indian consumers were ranked fifth in the state of personal finances and tenth in the list of willing shoppers in March. The dent in consumer confidence in the last survey was attributed to the uncertainty in the jobs market, the unavailability of consumer finance and the depressed state of the stock markets. In the last few months, workplace retrenchments have by and large stopped. In anticipation of an economic recovery soon, several companies have lifted the freeze on recruitment and begun to hire people. Most companies feel that this is a good time to hire because salary expectations are still modest. At the same time, the liquidity crisis has eased. Led by public sector banks, the availability of home and car loans has improved vastly. Car makers have recorded strong growth in sales in June and July. Real estate developers talk of good uptake for affordable homes. And the stock markets too have recovered, which has contributed to the better overall wealth effect. The perception in the markets is that the risk-aversion of overseas investors has now abated and they are once more ready to put their money in emerging markets like India. 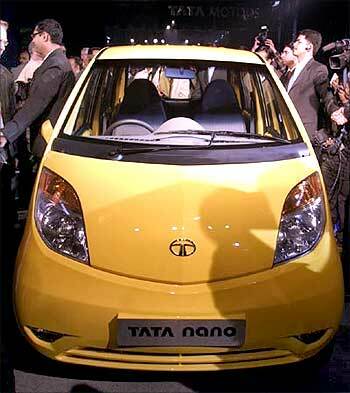 Image: Nano launch in New Delhi. Overall, the government is hopeful of growth (in gross domestic product or GDP) of over six per cent. This is way above what has been projected for the mature economies of the world. The Nielsen Global Consumer Confidence Survey is the largest study of its kind. This particular round covered 14,029 consumers in Europe, Asia Pacific, North America and West Asia and observed their confidence levels and economic outlook. The key outcome of the survey is that the global economic crisis seems to have bottomed out. Of all the 29 countries where consumers were spoken to, 25 have reported an improvement in their confidence in June over March. The index was stagnant in the United States and France, and fell a notch each in New Zealand and Germany. 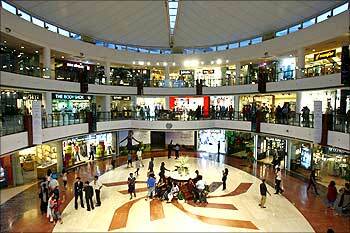 As a result, The Nielsen Global Consumer Confidence Index has risen five points from 77 in March to 82 in June. 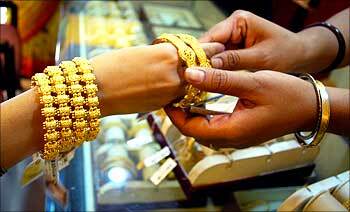 Image: A woman wears gold bangles at a jewellery shop in Allahabad. Most emerging markets have reported a sharp increase in consumer confidence. Apart from the 13-point rise in India, the index has shot up nine points in Indonesia, eight points in Brazil and Taiwan, and seven points in Russia. Some key mature markets too have done well in June. Thus, the consumer confidence index in Japan, South Korea and Hong Kong is up nine notches; Singapore, Italy and Great Britain seven points; and Canada six points. In the previous Nielsen Global Consumer Confidence Survey conducted in March, we were seeing the first signs that as far as the worlds consumers were concerned, the recession had bottomed out. Three months later, they're starting to embrace the idea of recovery, which is a major turning point, says Nielsen Director (business insights) Jonathan Banks. Stock market gains in the BRIC (Brazil, Russia, India and China) and Asian markets have also had a major impact on consumer confidence. 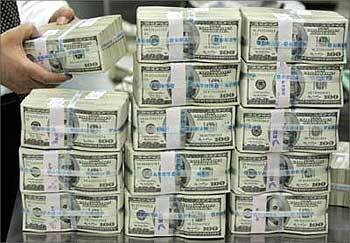 Image: $100 notes at a bank. What perhaps has caused the sharp improvement in Indian consumer confidence is the perceived improvement in the jobs market. In March, 41 per cent respondents from the country had said that job prospects over the next 12 months look good, while six per cent had said prospects look excellent. In June, 55 per cent have said that the prospects are good and 13 per cent have said the prospects are excellent. In other words, 68 per cent Indian, or two-thirds, were bullish on employment in June, up from 47 per cent in March. This is good news for marketers. Consumers had deferred purchases after huge layoffs in sectors like financial services, retail, real estate and even information technology. The fears of joblessness had spread to other sectors as well. Clearly, the fears have receded to a large extent. So, it could be the right time to engage once again with consumers, especially for big-ticket items like automobiles, houses or high-end gadgets. 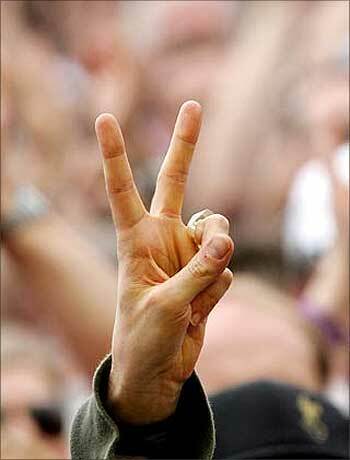 Image: A happy employee showing the victory sign. More important, as many as 74 per cent Indians have said they are bullish when it comes to the state of their personal finances over the next 12 months (good: 65 per cent, excellent: 9 per cent). In March, their proportion was 62 per cent (good: 56 per cent, excellent: 6 per cent). This could impact consumer behaviour in another way. Companies across sectors have complained that consumers in the last several months have started to downtrade settle for a lesser brand or a stripped-down variant. But the improvement in the perception of personal finances, fuelled in some measure by the rise in the stock market indices, could mean that the consumer could once again go for high-end brands or fully-loaded variants. 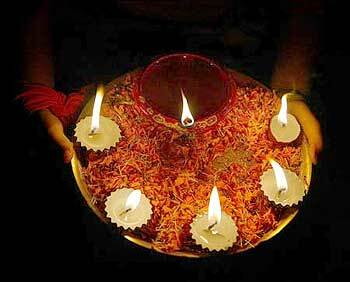 Image: A girl holds lighted lamps during Diwali celebrations in Siliguri. As a result, 43 per cent Indians have said they feel it is good time to buy the things they want and need over the next 12 months (good: 39 per cent, excellent: four per cent). In March, only 40 per cent Indian consumers shared this perception (good: 37 per cent, excellent: three per cent). Technically, India is going through an economic slowdown and not a recession. Most countries would do anything for GDP growth in excess of six per cent in these times. Still, 38 per cent have said in June their country is not in recession, up from 28 per cent in March. Conversely, fewer Indian consumers thought the country is in recession in June than in March. Also, 66 per cent Indians have said they feel the country will emerge out of the recession in the next 12 months, up from 56 per cent in March. Overall, 71 per cent of the respondents perceive their country is in recession a reduction of six percentage points from a high of 77 per cent in March. This is attributed to the fact that the stock markets in Asia and property prices are back at their pre-recession values. So, has consumer behaviour changed between March and June? Have their priorities altered in any way? Indians are likely to put their spare cash in to savings after covering essential living expenses, pay off debts or loans, buy new clothes, spend on new technology products and home improvement and invest in the stock markets and retirement funds. Conservative Indian consumers are unlikely to blow up the money on holidays or out-of-home entertainment. Between March and July, these two expenditure heads seem to have fallen out of favour with Indians. India does not feature in the top-10 list of countries when asked if they have in June spent less on new clothes, cut down on out-of-home entertainment, tried to save on gas and electricity, cut down on takeaway meals, switched to cheaper grocery brands, postponed technology upgrade, delayed the replacement of significant household items, used the car less often and cut down or settle for cheaper alcohol. However, Indian consumers did cut down on short holidays and breaks, telephone expenses, annual vacation, at-home entertainment and smoking in June and also looked for better deals in loans, credit cards and insurance. As for major concerns, Indian consumers have listed job security, economy and work-life balance, though these concerns have shown a decline since March. At 26 per cent, job security is India's biggest concern, while 13 per cent are concerned about work-life balance. Ever the caring children, ten per cent Indians are concerned about their parent's welfare and happiness. Six per cent are troubled by global warming and seven per cent are concerned about terrorism. Incidentally, of all nations, India is most concerned about terrorism. India is conspicuously absent in the list of health concerns, increasing utility bills, debt, children's education and welfare, increasing food bills, fuel prices, crime, political stability and war. Japan trumps the list of countries with no concerns, followed by Denmark and Thailand. 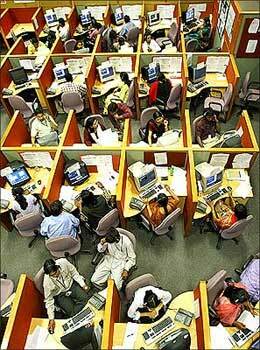 Image: Indian call centre employees.